Posted August 1, 2017 by ReceivableSavvy. 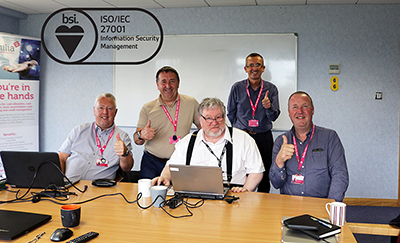 Rimilia are pleased to announce they have achieved ISO27001 certification, the internationally recognised standard for Information Security management, as part of an ongoing commitment to providing world class IT and data security. As a leading financial software company with a growing global client base Rimilia prides itself on providing the best possible security standards for its customers. The achievement of ISO27001 certification is a firm testament to the company’s commitment to this. ISO27001 is published by the International Organization for Standardization (ISO) and the International Electrotechnical Commission (IEC). Achieving accredited certification to ISO 27001 demonstrates that a company is following information security best practice, and delivers an independent, expert assessment of whether IT systems and data is adequately protected. As a business, Rimilia has recently seen tremendous growth and investment in delivering its pioneering artificial intelligence based SaaS solutions for Cash Allocation/Application, Credit Management, Bank Reconciliation and E-commerce to finance and accounts receivable departments around the world.